MacWorld Gets it About FileMaker 8: 5 mice! If you don’t have FileMaker 8 yet, read this review and upgrade. If you are a consultant or in-house FileMaker developer and want to convince your firm or client to upgrade, read this review and have them read it. The title says it: Easy-to-use database program morphs into a powerhouse. You really owe it to yourself or your organization/client to push this upgrade. It’s that good. Just last year, enthusiastic software reviewers throughout the computer industry greeted the release of FileMaker Pro 7 (; October 2004) as the most significant upgrade in the product’s history. With the release of FileMaker Pro 8 (see our first look), the company has done something surprising: Rather than resting on its laurels, FileMaker has released another significant upgrade about a year sooner than many industry observers expected. In retrospect, it looks as if FileMaker 7 was really the precursor to FileMaker 8. This is one of those situations where later your clients will say, *well, why didn’t you say so? * This is a no-brainer upgrade even though paying the upgrade fees will hurt some. Worth every penny. Just one little disclaimer for those who are still running FileMaker 6 or earlier versions. FileMaker 7 was a complete rewrite of FileMaker. And 8 builds on that. Depending on the complexity of your FileMaker application, you may need to do substantial work to prepare for and shepherd your database to the new file format and environment of FileMaker 7/8. If you are already on 7, there is no transition to manage. You are there. The good news for FileMaker 6 users, specifically, is that you can upgrade to 8 as cheaply as those who already paid to upgrade to 7 – skipping an upgrade fee. FileMaker 7 users, don’t be too resentful. FileMaker Inc. wants to make a very attractive offer to those who haven’t made the transition to 7. This entry was posted in FileMaker News on September 21, 2005 by janet. I remember one day long ago when it became possible to respecify a field by double-clicking on it. Can’t remember the version but whenever that happened it sure helped. I could double-click to find out what field I was on and read the full field name and I could option-drag a field to get a duplicate and then redefine it. Well, life has taken another leap forward for us long-toiling FileMaker developers. 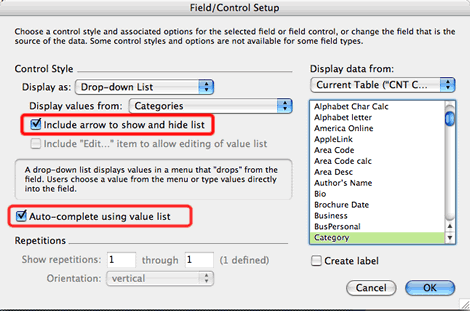 FileMaker 8 gives you a lot more than specify field when you double-click a field now. You get the entire Field Format dialog too. It came in the nick of time because some other OSX keyboard shortcut had recently stolen my Cmd-Option-F for Field Format and I haven’t sussed it out yet. But now I don’t have to. Double-click! What a concept? You’ll notice in my screen shot two other cool features. These both only work in 8, but at least you’ll be able to use them for your own databases immediately. Auto-complete using value list. Yay! Clairvoyance like Quicken! This works lightning fast and works best for value lists that are long such as industry, category, specialty, title, model. It’s implemented to perfection. Fixes the capitalization for you too. Just turn it on by clicking the checkbox for any field that has a value list. This will be a selling point that might help convince your customers to upgrade. Include arrow to show and hide list. I’m just getting used to this one so don’t know if I understand it’s full value yet. But for a start, you can choose to put a visual cue (an arrow we are used to in *real* applications) on pop-down menus. You give the user the option to use the pop-down or not. It looks and feels 10x better than most of the work around graphics we’ve used in the past to get this effect. This entry was posted in FileMaker Discoveries on September 19, 2005 by janet. For all practical purposes, FileMaker 7 took away the limits for how complex and large a FileMaker database can be. What it didn’t do is massively increase performance so that FileMaker 7 or 8 will always run at a acceptable speeds when processing and working with very large amounts of data. Since you can now create big databases that run slower than you like, FileMaker Inc. wants you to know ways you can improve performance when you are using big files. At Devcon 2005, FileMaker Inc. guru, Andy LeCates took some of his limited presentation time to advise us to turn off unnecessary indexing. Indexing a field means that every time something is done to modify the data in that field – such as entering, editing, replacing or importing – extra time will be taken to update that field’s index. By default, fields are set to Automatically create indexes as needed. And the easiest way to create your databases is to just leave that setting that way. Quick and dirty development that focuses on getting working versions up and running as soon as possible to get early user feedback, should leave this setting alone. However, once you are in the polishing stages of development, if you have a reason to optimize performance, indexing is one useful place to look. You can go through any table and look to see which fields have indexing turned on. And turn some of those indexes off by clicking None and unchecking Automatically create indexes as needed. If you look at the field definitions list, you may see a group of similar fields such as 8 rates fields and only one of them is indexed. You can probably safely assume that indexing rates is a rare need and just turn off indexing for the rate that had indexing turned on (automatically). It is better to avoid the performance hit of indexing than to make this rarely done find faster. This entry was posted in FileMaker Tips on September 14, 2005 by janet. Hi all. Just wanted to let you know that the formatting for FileMaker Fever is temporarily in flux. I had been using a custom design but TypePad now allows me to use all of its make-it-dead-easy features and then customize on top of that – which gives me what I’ve been asking for. Full customizability without losing all the ease of use I signed up for. This is one of TypePad’s new themes called April — I’m changing the colors a bit to give it a little more weight. I was looking for a theme with a white center column to match all my previously formatted graphics. I kind of like blue for this to compliment FileMaker’s blue. But I like dotted link underlines which I’ve added and prefer Georgia to the Times Roman default. And wanted a little larger type with more space. Now I just need to eliminate the underlines in the side column links. I plan to customize further to get exactly what I want. However, the documentation is sparse so it may take a little while. Fiddling with the CSS is fun but I can never remember the exact syntax since I only use it every few months. I just customized the Studio Manager Bulletin theme to my satisfaction. This one is improving. Luckily, TypePad’s support team provide a personal touch that fills the gaps when you get stuck and have a specific question. All I had to do was load the generic style sheet for April and then copy any pieces of it that I wanted to change to the Custom CSS entry box. Then I’ve been making little tweaks and previewing until I get what I am looking for. It’s easy people. Let’s see some more FileMaker bloggers out there! This entry was posted in FileMaker Fever, Web/Tech on September 13, 2005 by janet. Once you have FileMaker Pro 8 or 8 Advanced, it won’t take you long to create a tab control to stash away extra information for a record. Creating a control with several tabs takes all of about 30 seconds. The instant gratification quotient is off the charts. But my favorite part about the tab control is that once you’ve created the tabs and put fields and objects onto them, you can change your mind and instantly rearrange the tabs to an order that suits you or your client by dragging the tab labels up or down in the list. You can experiment with the order without penalty. The reason this works so well, is that all the fields and objects put onto a tab panel automatically attach themselves to the panel. This gives you the ability to drag the whole tab control around on your layout and also lets you rearrange tab panels without having to take extra time moving the contents of those panels! I decided to experiment with 8 using my own FileMaker system that runs my business. I took a layout that was just too darned big and decided to use tabs to allow me to take things off the layout and keep them somewhere very handy. 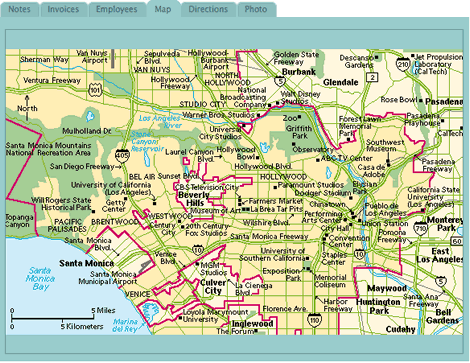 Above is an example which is still in progress as far as the redesign of the layout goes. Now that I have all this room, I want to re-think the layout and make it more attractive. I’m very much experimenting, but here I’ve got one big tab area and a smaller one for little stuff. The big tab area gives me room for wide portals for things like invoices. It also gives me room for notes and big graphics like the maps I use. Besides the shear speed of doing nice-looking tabs in your designs, another thing I like is the speed of switching between tabs. These things fly. There’s minimal overhead. Now my only problem is deciding when to use a tab control and where to actually create layouts. 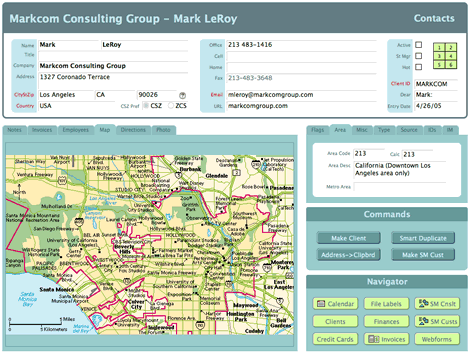 FileMaker says use them to expand what you can put on a single layout. I would love to hear your thoughts. This entry was posted in FileMaker Discoveries on September 13, 2005 by janet. Bob Bowers, FileMaker book author and CEO of Soliant Consulting, one of the top FileMaker consulting firms, has written a very practical and experience-based guide to migrating pre-7 solutions to 8. It is available as a pdf at FileMaker’s website. It’s called Best Practices Upgrading to FileMaker 8: Migrating pre-.fp7 solutions to FileMaker 8 and getting the most out of the new FileMaker 8 features. Read this before you upgrade from FileMaker 4/5/6 and you should be in good shape. Much better shape than you would be without it. Don’t forget to complete the checklist. Many of the other technical briefs are now referring to FileMaker 8, but some seem to have just be superficially refreshed. There may be some important changes here and there, though, that I haven’t spotted yet. Please let me know what you find. All the technical briefs are available here. This entry was posted in FileMaker Resources on September 12, 2005 by janet.